What happened this year… not a whole lot! I released the second Radiation Canary novel, “Greatest Hits.” Publisher’s Weekly liked Trafalgar & Boone’s second outing and called it “aggressively feminist,” which I took as a compliment (as one should). But the most important thing is that Riley Parra came to life in a BIG way! In February, I was introduced to the woman who would bring Riley to life: Marem Hassler. She is so good, and so dedicated to the character, and so eager to get it right. It’s like Ryan Reynolds with Deadpool. Just the absolute right person combined with the heart and determination to do justice to the character. And the rest of the cast? Maeve Quinlan was in 3Way, the first lesbian webseries I ever saw, and Liz Vassey! I’ve been a fan of Liz Vassey for a long, long time, and the idea of having her in something I wrote still needs to sink in. Correction: I’m still grappling with the fact she knows who I am, and she’s been following me on Twitter for a good while now. 😉 The Riley Parra crowdfunding went AMAZING, and gained me a lot of new readers who have fallen in love with the books. In personal news, my father died earlier this month. He had cancer, and toward the end he needed hospice and a lot of round-the-clock care, so I was doing that instead of writing. Now that he’s passed on (and the memorial and everything has been taken care of) I’m hoping to get back into the swing of things with the new year. I hope everyone has a safe, happy new year! 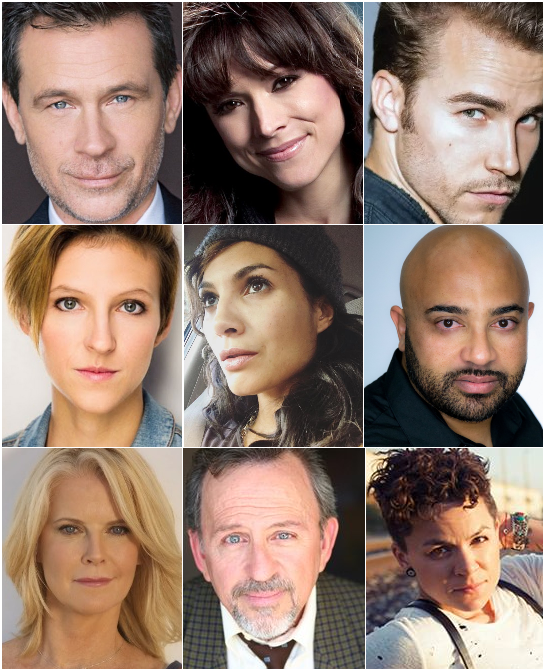 Riley Parra’s cast is growing! One of the first shows I was ever a huge fan of was Star Trek TNG. There was a guest star in one episode, a young woman played by Liz Vassey who had been hurt in a Holodeck accident. Then I was a fan of Wings. Liz showed up there, too. And in Quantum Leap, Early Edition, CSI, Castle. Even shows that critics foolishly ignored like Maximum Bob, The Tick, or Push Nevada (Push would totally have been a huge hit in the Internet age, BTW). She’s like the Stan Lee cameo of shows I thought were great. She’s Nikki in Nikki & Nora! She’s Fury Leika in Dr Horrible! SHE’S GILLIAN HUNT IN RILEY PARRA. This woman I’ve been a fan of almost as long as I’ve been a fan of television is going to bring to life one of my characters, and I’m just completely over the moon freaking out about it. I knew when we got Marem we ran the risk of Gillian not being quite amazing enough to match her, but I can let go of that fear. We’re 83% funded but there’s still time to help out! Riley Parra Crowdfunding is live! If you want to help out, donate here! If you can’t, that’s fine! Help us spread the word as far and wide as possible! On November 1, 2006, I started writing a novel I conceived specifically for NaNoWriMo. I didn’t expect anything from it, but I posted each chapter online as I finished them. When the novel was finished, the archivist of the site I was using emailed me and said it was a great story and if I ever considered publishing it, she worked as a cover artist for a small company who might want it. That’s the dream, right? So I agreed to submit the novel to them. I didn’t even bother to edit it very much before I sent it in. But on December 19, they replied and said they wanted it! They wanted to publish my book! I was going to be a published author! That book – On the Air – came out in 2007. I followed that with a novel called Gemini, for which I won a Golden Crown Literary Society Award (a prestigious award for lesbian fiction which no man had ever won before). After that, there was no stopping me. Tilting at Windmills, which was the start of a five book series. World on Fire. The Following Sea. My publisher went out of business after releasing five of my novels, but my friend had just started a company of her own and wanted to use me as an established author just to get off the ground, so I already had a safe haven. The books didn’t slow down. It’s been ten years since that Halloween night I sat staring at the clock, waiting for it to tick over to midnight so I could officially begin NaNoWriMo. I had the first line ready to go for weeks ahead of time (that line ended up getting edited out of the finished product, naturally). In the years since, I’ve received TWO Golden Crown Awards (still the only man to ever win, as far as I know). I’ve signed up with MGM and Fandemonium novels to write fiction based on Stargate SG-1 (one novel, Two Roads, and two short stories). One of my novels, Trafalgar & Boone, received a starred Kirkus review and was named one of their best indie novels of 2015. And, most amazing of all, one of my novels (Riley Parra) is being turned into a webseries for Tello Films! An actress is in prep right now to play a character I created, and it’s so amazing seeing her post on social media about how much she loves the character. It starts filming in January (you can find out more on Twitter or Tumblr! ), and I can’t wait to see how it turns out. I don’t know what I would’ve been doing in November 2006 if it wasn’t for NaNo. I may have eventually written that exact same novel at some point, I probably would have posted it on that site, and everything might have gotten rolling the same way it did in real life. But who knows when that might have happened? NaNo set me off, NaNo got me in a chair and writing, and by that time the following year, I had a published paperback novel in my hand. Being a writer doesn’t start out with a publishing contract. It doesn’t start with a crash of lightning and a declaration that “THIS will be the ONE…!” It starts with a story, just like it always does, and one line written on a blank page. Coming September 1! Trafalgar & Boone in the Drowned Necropolis, the sequel to the novel Kirkus Reviews named one of the best Indie books of 2015! Last year, readers met Lady Dorothy Boone and her rival Miss Trafalgar, two rival explorers forced to join forces against an enemy who wished them both dead. The bond forged during that adventure remained strong enough that the two women decided to join forces. Now, a year later, their partnership has grown beyond its shaky first steps and has begun showing signs of a union that may be the only thing that stands between the world as they know it and whatever horrors the future may hold. Return to the world of Trafalgar & Boone, a London recovering from a Great War fought with magic and only now beginning to see the consequences of what has been set loose. The cracks of the world are beginning to show. The ancient evils long thought extinct are gaining strength. Trafalgar and Dorothy, along with Dorothy’s majordomo and lover Beatrice Sek and a host of other allies, must put aside their bickering and petty differences to discover where the threats are coming from, how they were stopped, and how to prevent the end of civilization. Well, it’s come to an end, folks. There was laughter and tears. Rivalries formed. Friends became enemies and enemies became friends. Nothing will ever be the same again. Not because of the Storybundle, but just… in general. It’s been a really busy couple of weeks around here. But the hordes of readers did respond to our call and we managed to hit our goal! That means Heather Rose Jones and I have to make good on our promises! She’s already close to giving away all her copies, so if you haven’t snatched one up yet go comment! As for my offer, be one of the first five commenters on this post who bought the Storybundle (honor system!) and you’ll get your very own ebook copy of “Trafalgar & Boone in the Drowned Necropolis”! It’s the sequel to the Trafalgar & Boone novel in the bundle, and it’s not available for purchase until September 1! That’s right, for helping support the Storybundle and authors and getting young girls interested in writing, you get to read the book before anyone else! How awesome is that? So comment! Let me know how to get in touch with you so we can work out the delivery details! We’re in the final few hours for the Storybundle that includes Trafalgar & Boone and Stag & Hound, plus nine other fantastic novels! In case you missed my last post, you pay $5 for five novels. But if you pay a little bit more, you get ELEVEN novels. Just barely a dollar each. Not too shabby! The Storybundle has been going so well that Heather Rose Jones has decided to give five lucky bundle purchases an extra reward for their support (you can read all about her giveaway over on her blog and comment to win!). I’ve decided I want to follow her lead and do the same thing. We’re very close to a really cool milestone. If we manage to cross that line, I’ll put up a post like Heather’s. The first five people who comment saying they bought the Storybundle (we’re going by the honor system here) will get a copy of Trafalgar & Boone in the Drowned Necropolis, the sequel to the Trafalgar & Boone novel in the bundle. You won’t even be able to buy it until September 1, but since you were so super-cool enough to support authors and some fantastic charities, I want to reward you a little bit. If you’ve already bought the bundle, thank you! I hope you enjoy the stories! If you haven’t hopefully this is just the incentive you needed to dive in!